Rustic yet modern, these barstools cozy up comfortably to the kitchen counter - or island - with so you can easily chat or dine with your family and guests. Sit in Old World style with the upholstered Bradley Barstool. This counter height barstool has a dark bronze powder coat finish that highlights the elegant scrolled design in the back. Our Kavara counter height bar stool adds a raw yet refined aesthetic to any dining room or any kitchen. Our Willoughby counter stool features a traditional design constructed from lightly distressed pine solids for an elegant rustic touch. This barrel stool feature a French or American oak cooperage stamps. This piece is finished with 3 coats of furniture grade lacquer and accented with an original metal barrel band as a foot rest. Add a unique seating arrangement to your living room with this Aspen Skies Swivel barstool. 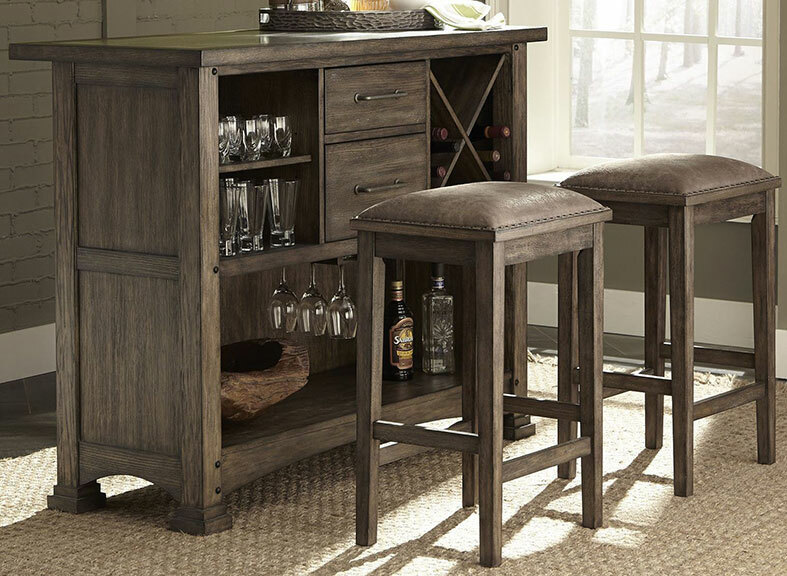 Perfect for adding a few extra seats for guests at a party, this items creates a fun bar atmosphere into your home décor. With matching wood finishes, you can’t go wrong with the Heatherbrook barstool. Including one table and three chairs, this items is ideal for any home. Perfect use as your main dining table for smaller spaces, or as extra seats and serving space for larger homes. Nailhead trim and leather upholstery on the back and seat add to the rustic meets industrial character of this barstool. Its sturdy construction and clean lines make the Cannon Valley barstool a wonderful addition to any home.